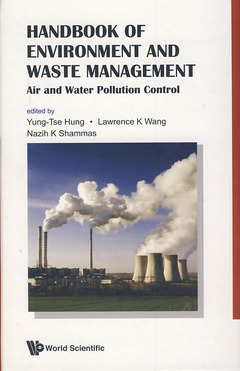 The Handbook of Environment and Waste Management, Volume 1, Air and Water Pollution Control, is a comprehensive compilation of topics that are at the forefront of many technical advances and practices in air and water pollution control. These include air pollution control, water pollution control, water treatment, wastewater treatment, industrial waste treatment and small scale wastewater treatment. Internationally recognized authorities in the field of environment and waste management contribute chapters in their areas of expertise. This handbook is an essential source of reference for professionals and researchers in the areas of air, water, and waste management, and as a text for advanced undergraduate and graduate courses in these fields. Air Pollution and Its Control. Air Quality Modeling and Prediction. Air Pollution Problems and Control Measures in Steel Making through DRI Route. Air Biofiltration Applied to Odor Treatment. Drinking Water Associated Pathology. Disinfection in Wastewater Treatment. Treatment of Commercial Surfactants with Chemical and Photochemical Advanced Oxidation Processes. Membrane Separation for Water and Wastewater Treatment. Municipal Wastewater Treatment for Reuse in Agricultural Irrigation. Combine Sewer Overflow Treatment. Stormwater Management Planning and Design. Biological Wastewater Treatment. Aerobic Granulation Process for Waste Treatment. Sequencing Batch Reactors. Impact Assessment on Aquatic Pollution. Decentralized Sewage Treatment Technologies. Wetland for Waste Treatment. Land Treatment of Wastewater. Physicochemical Treatment Processes of Landfill Leachate. River and Lake Pollution. Removal of Dyes from Wastewaters by Low-Cost Adsorbents. Treatment of Olive Oil Production Wastewaters. Medical Waste Management. Enzyme Technology for Environmental Engineering. Screening and Selection of Microorganisms for the Environmental Biotechnology Process. Innovative and Cost-Effective Flotation Technologies for Municipal and Industrial Wastes Treatment. Municipal Wastewater Treatment.